Professor do PPGCS participou do lançamento da Frente Parlamentar de Luta Contra a Tuberculose, que ocorreuno dia 26 de março na Câmara dos Deputados (Brasília). 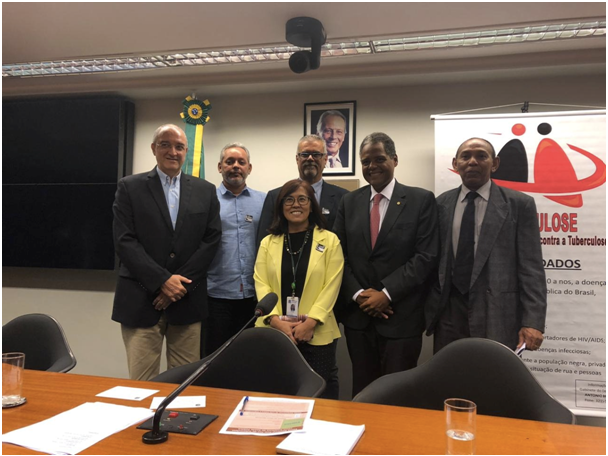 A mesa foi compostapelo Dr. Fabio Moherdaui, (Diretor da OPAS/Brasil); Ativista Jair Brandão (Parceria Brasileira contra a Tuberculose); Prof. Pedro E. Almeida da Silva (FURG-Vice-presidente da Rede TB); Dra. Denise Arakaki (Coordenadora do PNCT);Deputado FederalAntônio Brito (PSD-BA)e Dr. Gerson Pereira(Diretor do DIAHV/SVS/MS). O principal objetivo da Frente é qualificar o controle da tuberculose, combatendo o preconceito e conscientizando a população sobre a importância do diagnóstico e do tratamento adequado, ações estas que estão integradas no Pilar 3 (Pesquisa) da Estratégia Fim da Tuberculose (End TB Strategy)que, por sua vez, estabelece a necessidade de aumentar o investimento em pesquisa na tuberculose, bem como promover a introdução dos resultados nos programas de controle desta doença. 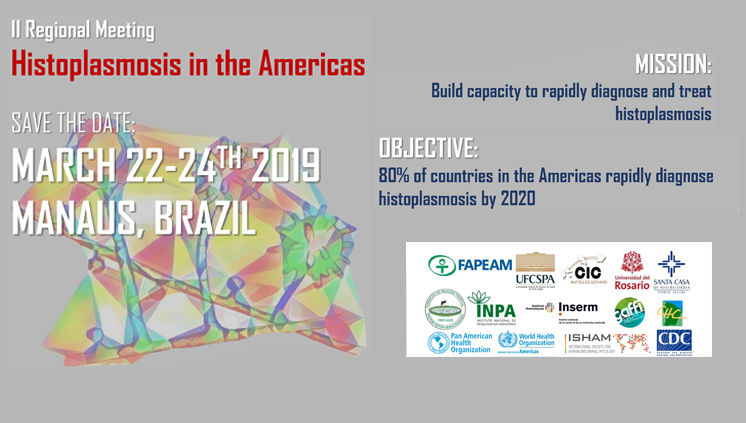 As professoras Melissa Xavier e Rossana Basso participaram do II Regional Meeting Histoplasmosis in the Americas, sediado em Manaus, nos dias 22 a 24 de março que foi promovido pelo Histoplasmosis Advocacy Group (iHAG). O evento contou com a presença de mais de 100 participantes de 22 países das Américas. Tom M. Chiller (Diretor da Micologia do CDC Atlanta) e David Denning Presidente do GAFFI (Global Action Fund for Fungal Infectious) destacaram a importância da implementação de métodos diagnósticos mais sensíveis para esta micose. O objetivo do Encontro foi contribuir para que 80% dos países das Américas possam diagnosticar a histoplasmose de forma rápida até 2020, quando foi assinada a declaração de Manaus. 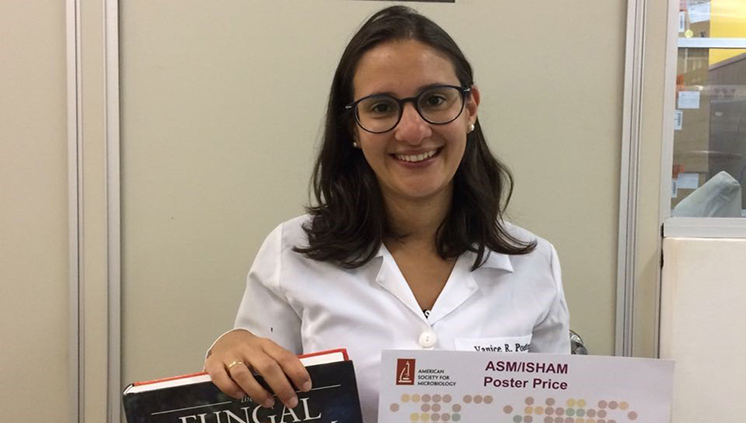 As professoras destacaram a importância da participação da Faculdade de Medicina da FURG na esfera internacional, tendo em vista estratégias de controle e diagnóstico precoce da histoplasmose, esta micose sistêmica que tem alta letalidade no paciente com imunodepressão. 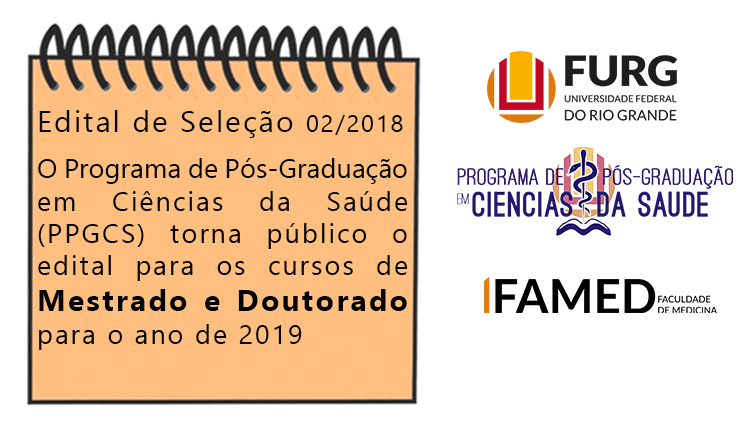 The Graduate Program in Health Sciences of the Federal University of Rio Grande (PPGCS-FURG) was created in 2005 and through the Master’s and Doctorate Degreesis aimed at the training strengthening of human resources, with emphasis on the lines of Technology applied to the Study of Infectious and Parasitic Agents, Epidemiology, and Health Promotion and Recovery. Development of inputs, processes and platforms that aim to promote the prevention, diagnosis and treatment of diseases of national interest. The projects related to this line seek to reduce dependence on imported products and collaborating to build a health technology base in southern Brazil. From new pharmaceutical forms such as nano carriers as well as natural and synthetic sources of new drugs, the related projects to this line aim to advance in the knowledge of technological and nature potentialities in order to obtain alternatives for infectious parasitic diseases among others. The research line of Environmental and Occupational Health aims to encompass projects that investigate the relationship between the environment (external, internal and work) and determinants of health, well-being and quality of life. Also included are studies on the influence of environmental and occupational factors on morbidity/mortality and on the relevance of a healthy environment to the maintenance of quality of life. It develops researches in order to study the picture of the Chronic Non-communicable Diseases and their risk factors. It presents a theoretical and analytical framework for its social determination, oriented towards public health actions. It also investigates epidemiological aspects to the health of the population in general, and, especially, vulnerable groups. Study of infectious diseases in which the causative agent is acquired in the hospital environment and that clinically manifest in the patient during its stay or even after discharge. The developed studies are based on the knowledge of factors that are associated with pathogens, host and environment. Though in a more pragmatic way, the impact of the infection on both the patient and the public health is also studied, as well as items related to the cost-effectiveness of new control strategies such as the implementation of protocols for the rational use of antimicrobials, disinfection and antisepsis procedures, diagnostic methods, measures that monitor and control infections. Regarding antimicrobial resistance, the studies are not restricted to hospital infections but also cover those infections acquired in the community: antimicrobial resistance rate, resistance mechanisms, biological cost and fitness of resistant pathogens, dissemination of resistant pathogens, horizontal transmission of associated to resistance genes and the evolution of the resistance against selective pressure by antimicrobial consumption. Infectious parasitic diseases are an important cause of morbidity and mortality in our country, especially in people and places with greater social fragility. In this line there is a development of projects that seek to deepen the knowledge regarding prevention, diagnosis and treatment of these diseases.